Pictures below are color versions from April's Your Country Neighbor, page 8, "Country Scenes." 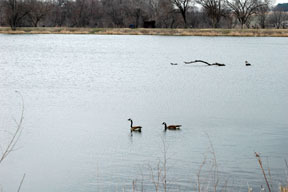 I have a picture of a Canada Geese family on this lake west of Verdon, Nebraska taken last year. Maybe this pair I saw last month is related. 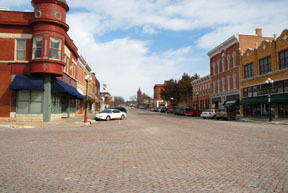 Marysville, Kansas is an impressive town with interesting shops and a busy downtown that appears to rival towns approaching twice its size. 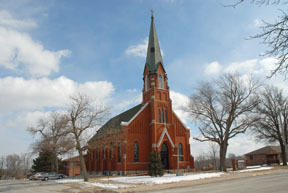 The surrounding agricultural area must give the town good support. 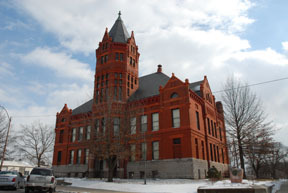 The first thing I noticed driving into Marysville was this Courthouse. 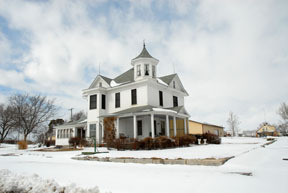 I like to photograph domestic architecture as well as wildlife and landscapes. A little early in the Spring for leaves on trees; I took this in early March. 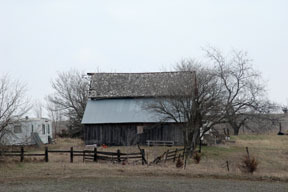 Mistakenly associated with Shubert, NE in the publication; this barn is closer to Stella.